Rey and the gang are greeted by a familiar sound when they enter Maz's castle in Star Wars: The Force Awakens: cantina music played by a jolly band of aliens. 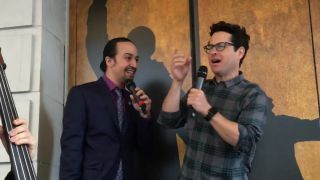 It was a fun little detail that helped link the film back to the original Star Wars, but there's an even better story behind it - one that Lin-Manuel Miranda, the creator and star of Hamilton, shared with the line of people waiting for tickets to his hugely successful Broadway musical this morning… along with The Force Awakens director JJ Abrams, who proceeded to perform the song with him. Even cooler than the Huttese verses translating to a Shaggy-style "It Wasn't Me" all along? You can listen to the full cinematic version of "Jabba Flow", also written and performed by Miranda and Abrams, on StarWars.com, or buy it for a Washington on iTunes. Less cool is how the title and lyrics imply that not only did Jabba the Hutt have a lover before Leia choked him to death in Return of the Jedi, he might have had two. Bleugh.